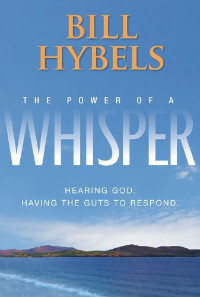 Today we’re reviewing, discussing, and giving away The Power of a Whisper by Bill Hybels. Keep reading to learn how you can win a free copy. In The Power of a Whisper, Bill Hybels, founding pastor of Willow Creek Community Church, casts a vision for what life can look like when followers of God listen to His voice and follow His promptings. The book contains insight into how to discern whether a “nudge” is from God, what to do if you’re not hearing from God, and the various ways God speaks to his followers. Oh! Give me Samuel’s ear, An open ear, O Lord, Alive and quick to hear each whisper of Thy Word; Like him to answer to Thy call And to obey Thee first of all. If there is a pattern in Scripture regarding whispers, it is that we serve a communicating God—a God of words. God is available. He is approachable. And he is ready to talk to you now. Your move! Reduce your speed. Stop multitasking. Lower the ambient noise in your life—and then listen for God to speak. The most predictable way to hear from heaven is to read and apply God’s Word. God is near… The Lord is close to the brokenhearted and saves those who are crushed in spirit. God seeks… God is near. But his presence is not passive. He seeks us out so that he can encourage us to keep going, to move ahead, to live. Almost every time you hear a prompting from God, something safe or predictable most likely has to go. The Power of a Whisper is likely to be met with skepticism by a lot of people. After all, how many times have we heard, “God told me to…” from people cooks, liars, cheats and worse. Others may think, “Maybe God speaks to pastors like Bill Hybels, but he’d never speak to an average, messed-up guy or girl like me.” But Hybels makes the case that receiving regular promptings from God need not be rare or exceptional but rather a normal part of the everyday life of the average Christ-follower. That’s mind-blowing if you think about it. Imagine what it would be like if periodically the president called you from his cell phone to give you little national security assignments… and Dr. Phil occasional sent you a text that had the perfect relational advice… and your mom called to encourage you… and they were always right, always said exactly the right thing and the perfect time. That’d be pretty exciting and fulfilling if you ask me. I can think of a few occasions when I sensed God clearly speaking to me. When I was deciding which college to go to, I clearly sensed God pointing me to Valparaiso. And later in college when an opportunity for a coop job close to home was offered to me, I sensed God saying, “Let this pass. I’ve got something better for you.” I did, and He did. But as for the life Bill Hybels describes, full of little assignments, encouragements, and insight from God on a daily basis. I haven’t experienced that on a regular basis. I’ve had a taste though. I believe it’s possible, and it’s the adventurous life with God I long for. The Power of a Whisper contacts lots of useful instruction about how to hear about God, but what I appreciate most about the book is that it enlarged my dream. It expanded my vision for what’s possible both in my life and in the life of others. Do you think God speaks today to those who are listening? Why or why not? Can you share a story of when God spoke to you? Tweet this post or share it on Facebook. I’ll announce the winner at 5 PM Eastern time Wednesday, December 22. Or just buy a copy of The Power of a Whisper.